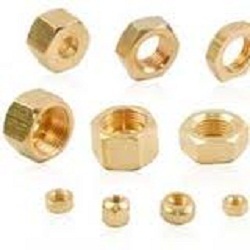 We are one of the prominent firms, engaged in offering a supreme quality range of Brass Nut. Established in 1963 at Jamnagar, (Gujarat, India), we “Dodhia Brass Moulding Works” are a “Partnership Firm”, engaged in manufacturing and trading a high quality assortment Brass Pneumatic Fittings, Brass Product, Brass Fasteners, Refrigeration Parts, UPVC Product, etc. Under the guidance of our mentor “Ashish Dodhia”, we are able to fulfill exact demands of our precious clients.